Most problems can be fixed with a prepackaged Admixture (Fritz-Pak Corporation). Warm temperature and concrete is setting too quickly - Add a retarder to give more time to finish the concrete before it hardens. Concrete is not workable - To improve work-ability and durability without increasing the water content, add a super plasticizer (water reducer) and a finishing aid that enhances surface finishing characteristics. Avoid: Products that contain calcium chloride or chloride ions which may discolor colored concrete. Pozzolans - This admixture improves finish-ability, reduces permeability and efflorescence (concrete salts coming to the surface causing white blotches) and minimizes the bleeding of color. Pozzolans may also cause retardation, so this is something you need to be aware of when using. Cool temperatures - Use an accelerator to speed up the set time. 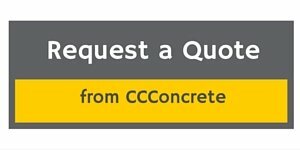 Concrete that will be exposed to freezing and thawing - Use an air-entraining agent. The directions on the back of the packages of the admixtures show the concrete mixing ratios. Use a "thick mix" - one with sufficient amount of cement paste to provide a surface that takes imprints well. Generally, 5 1/2 to 6 bags of cement per cubic yard of concrete. The larger the nominal aggregate size, the less the concrete will shrink. 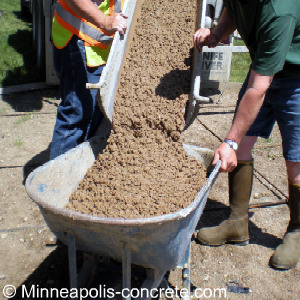 Look for a maximum aggregate size of 3/4 inch, or 1/2 inch if you're using a pattern with a deep reveal. Avoid using straight pea rock mix (3/8 inch aggregate) - especially if the concrete is 5 or 6 inches thick.